The day has come! I was wondering when I would finally get to review this set. 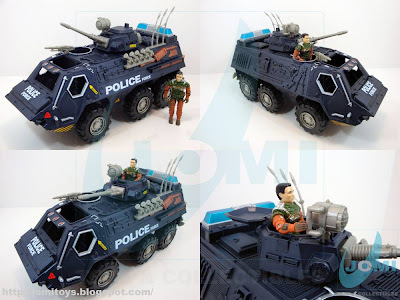 Or any set with the great Chap Mei armored car. 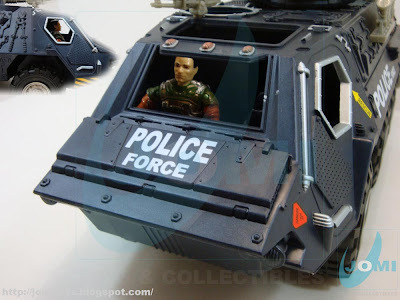 Or armour car. Or better yet, like printed on the box... "Amour" car. In french, means "love", so maybe it was a intentional blooper... since it sure brings love to all gangsters. A groovy kind of love! Although pretty excited to start this one, experience tells me to be patient, since CM tends to make things look cool but just fairly functional. 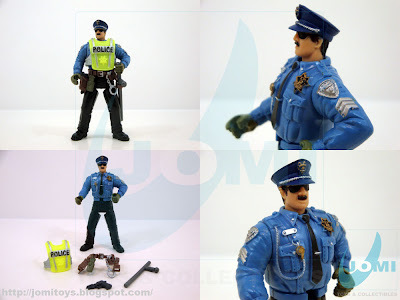 The figures: "Officer Hammer", refer to "Police Force Figure Playset - Officer Hammer" for more details. "Officer Petersen". 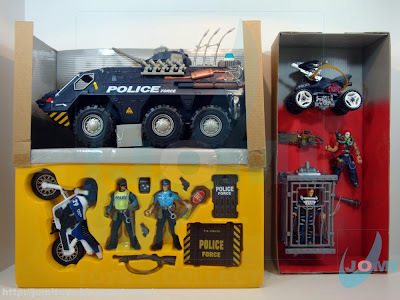 "Snaky Drake", refer to "refer to "Police vs Bad Guyz Figure Playset - Motor board" for more details. "Barrcode". 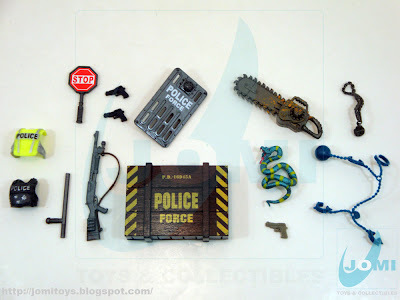 For more details on this figure, refer to "SWAT Police Barrcode Arrest Playset". Figure: "Officer Petersen". Finally reviewed. 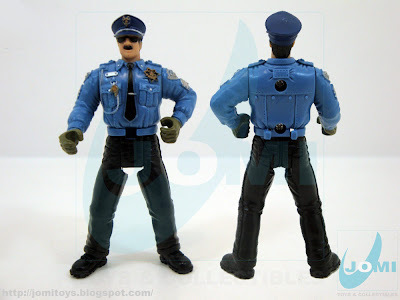 Decent looking figure, maybe a bit too "proud" or heroic-looking for a cop. But will certainly do as an addition. 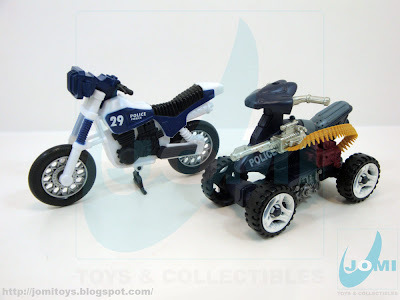 Quad and Chap Mei motorbike "MkI". 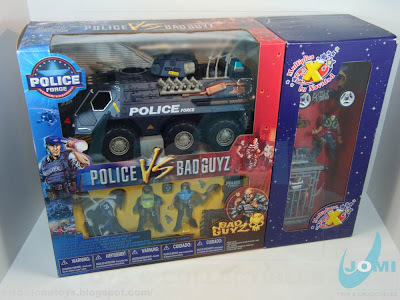 For more details on the ATV, refer to "Police vs Bad Guyz Figure Playset - ATV". Motorbike review coming soon. 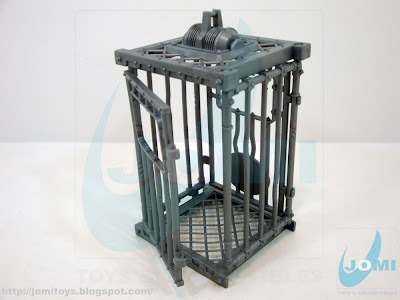 Cage. To be reviewed soon. Effective and multipurpose. 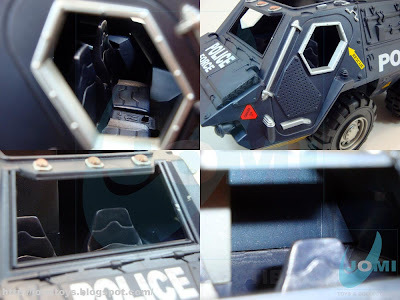 The armour car, or A.P.C. 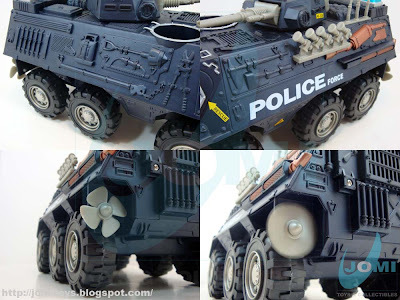 Light-armored vehicle with some structural similarities to real-world counterparts such as "Mowag Piranha", "IAV Stryker" , "ASLAV" or even some "BTR" series IFVs. 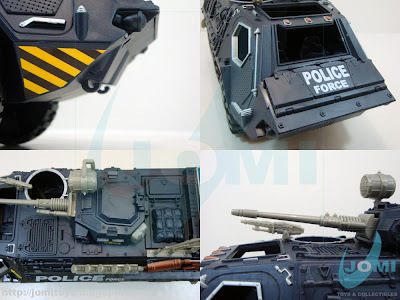 However, considering a visitor´s information and deeper knowledge, and to whom we thank for, the vehicle lines come from the "Transportpanzer Fuchs" German IFV. Angle shots and working propeller. 2 figures seat at the front. 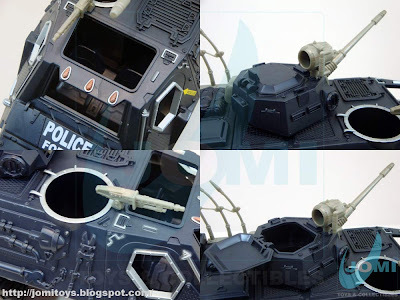 Furthermore, there is a small section behind the driver similar to the one seen in the "gangbuster". Unfortunately, there is no way to fit a figure there, due to the lack of doors/hatches. Back section. Great detail and the screws, for a moment, gave me hope. I was crossing my fingers in hopes of finding a wide empty space for future customization. Found the remnants of an (supposedly) inactive SFX battery compartment. Detail shots. Top left: chin detail with hooks. 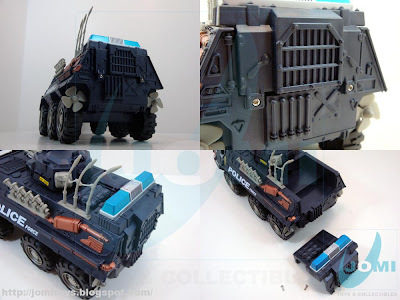 Great scale, sweet details and lack of doors. There is no other word to describe how I'm stunned by this set. Where to start? 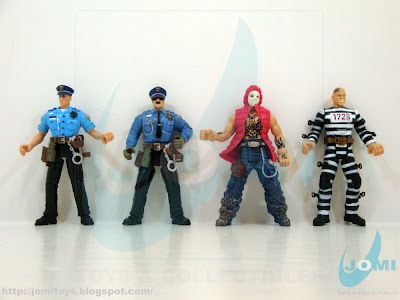 Very cool figures, from cops to gangastares. I could get as many Barrcode figures as possible. They are great, very great sculpted. 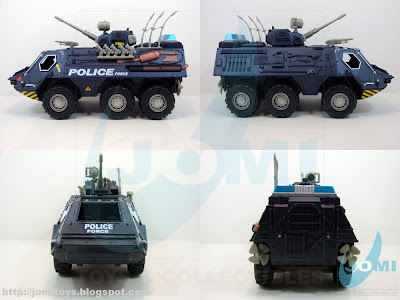 The acessories are perfect to match the figures inside the package, but the vehicle/APC is just wonderful. 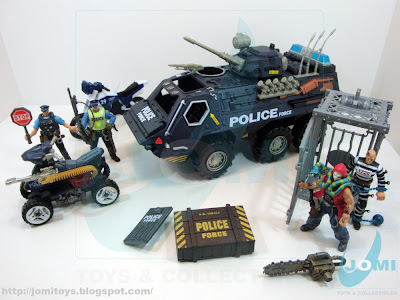 My urban force could benefit from it. Point for you reviewing this set!! !